I mentioned earlier this week that we have been hard at work on our new vegetable garden. It’s my first time growing a garden, and I’m really excited. Part of the fun of having a garden is making it cute right? 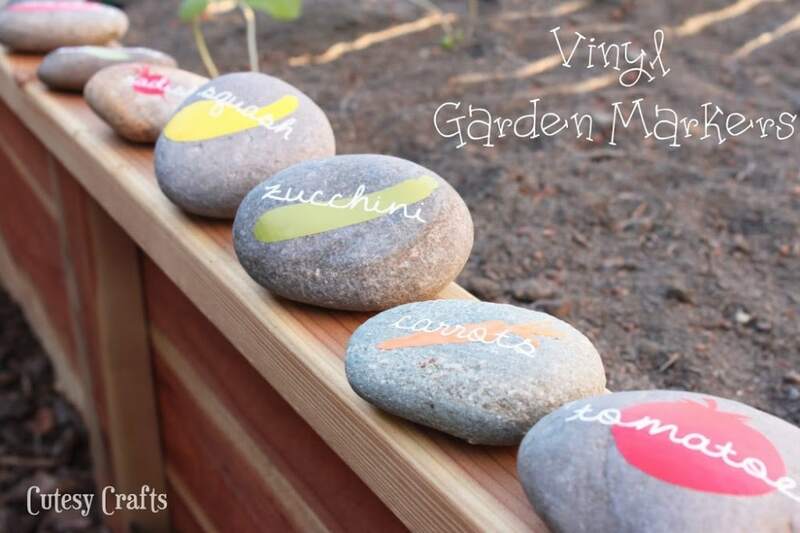 I have seen a few examples of DIY garden markers painted on rocks, and I thought they would look really good done in vinyl. Here is what I came up with. Huge thank you to my step-dad for helping us build the raised bed! Doesn’t it look great?! 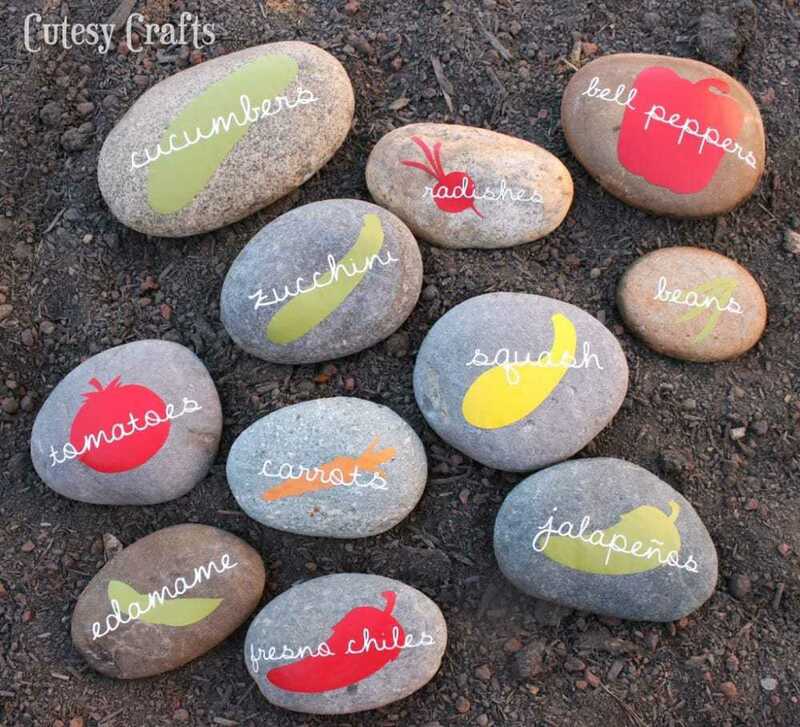 For each rock, I used my Silhouette CAMEO to cut the shapes and names of the vegetables in vinyl. You want your rocks to be as flat and smooth as possible so the vinyl will go on nicely. I made my own free vegetable Silhouette cut files that you can get here for personal use. I also made them available in svg and pdf formats. You will need to size them according to the rocks that you have. And… have you seen the rain gutter garden ideas going around? My friend gave me some leftover gutter, so we hung it on the fence to try and grow herbs and strawberries in. Maybe we will add a few more rows next year. The gutter got some cute little vinyl labels in a pretty turquoise. Now just crossing my fingers that I don’t kill everything! Grow garden grow! 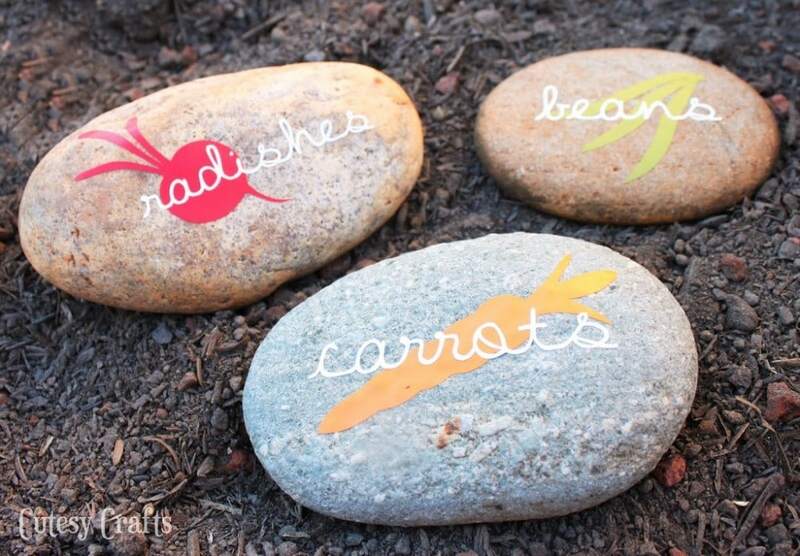 Have you made your own DIY garden markers? I’d love to hear about them! I LOVE these!! Now the collection for the ‘perfect’ stones begins now… Thanks for sharing, can’t wait to try it out 🙂 Pinned to my Things to Make and Do board! Love this idea! I’ve never thought to use rocks as plant markers. If you’re worried about them lasting the season, spraying them with a coat of clear enamel should do the trick. 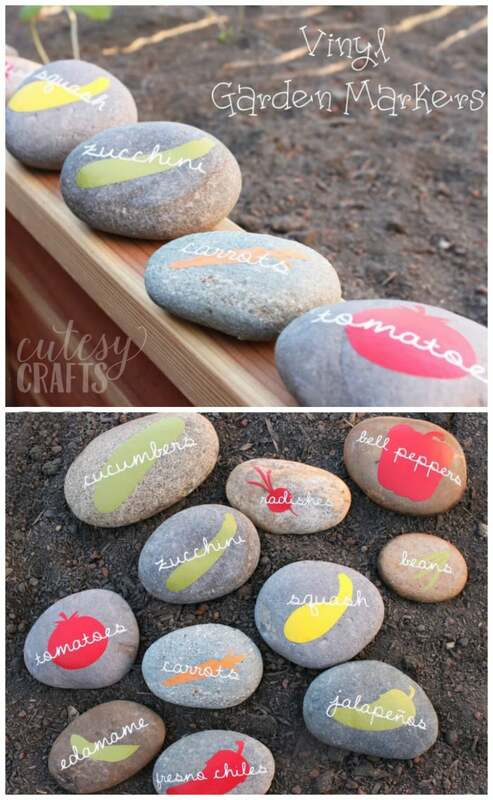 I love these rocks and more importantly my kids would love these for our vegetable garden. Thanks. So cute! Thanks for sharing. This is adorable! Using vinyl is so smart! Your designs are really cute, too. Love! I finally got some things planted today…I’ll need markers soon! 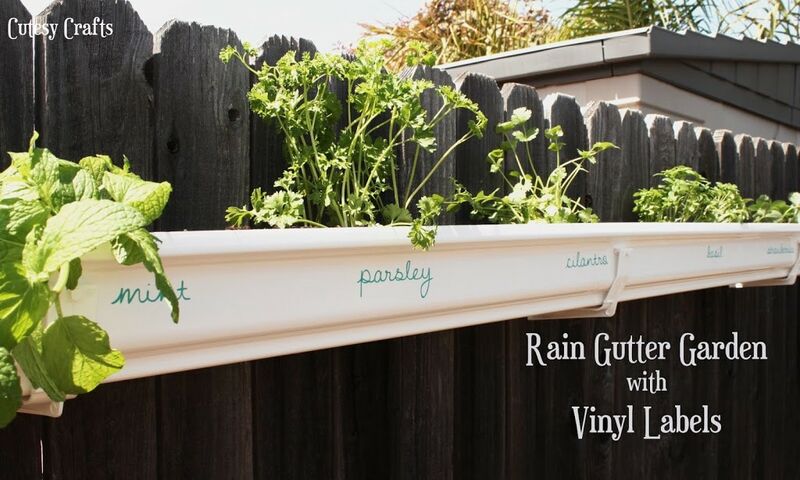 New here – while I think the rock idea is cute I am in LOVE with the rain gutter herb garden idea! Thanks for sharing! Thanks Jenni! Thanks for the nice comment! THESE ARE DARLING! 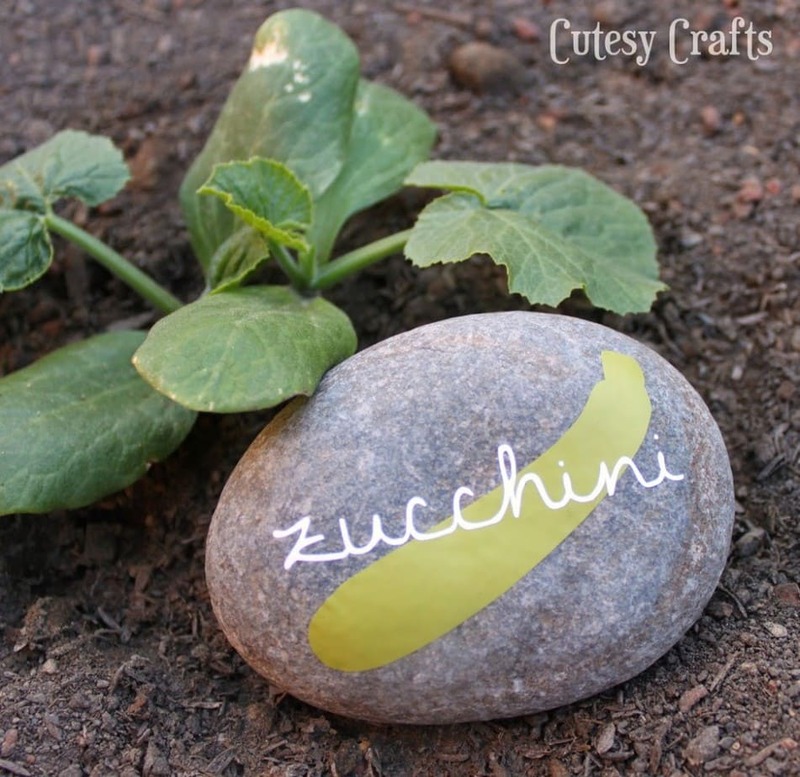 I have been wanting to make my mother in-law some cute garden markers but all the others were kind of the same old same old, these ARE PERFECT! I LOVE LOVE LOVE THEM! These are awesome! 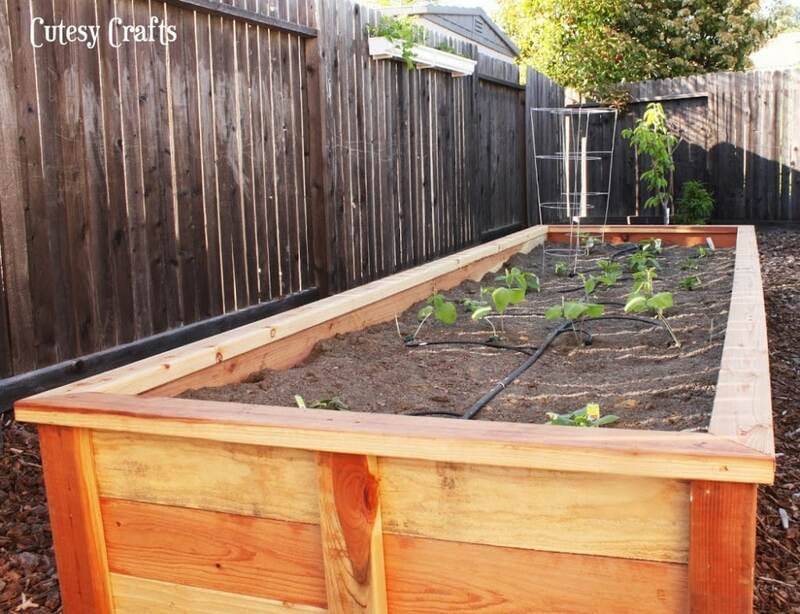 Good luck with your first garden! I love your rain gutter garden!! Your pictures are so good. 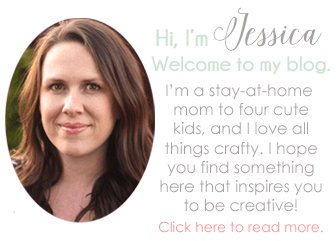 Thank you for sharing at our Link Up Party at allthingswithpurpose.com!! what a great garden you’ve got! These are awesome! And the gutter herb garden – genius! I have a Cameo – I don’t know why I haven’t ever thought of this! Just one question, what font did you use? I can’t seem to find any handwritten font I like, but yours is pretty cute! Thanks! I used a free font that I downloaded from dafont.com called Stars From Our Eyes. Let me know if you need help installing it. Make sure to “weld” it together before you cut since it’s a cursive font. Such a cute idea. Kids would love this for our yard! Jessica–you make it very hard to live without a silhouette! Maybe mother’s day… But, I love this project. I can’t wait to get my garden in, but first it has to stop snowing here! So jealous of you! Oooh, I love your little rocks! So cute (I wish I had a Silhouette…) oh well, I have this linked to my DIY plant markers post too today! !